This is a framed page. Please click |CARS| below. All right -- so you can’t read it. The odometer is turning from 99,999 to 00,000 (only five digits on the odometer -- I guess they didn’t expect it to make it this far). I was a bit busy at the time, so I couldn’t focus the SLR. I tried to pre-focus it before I got going, but you know how these things work out. I took this picture on the Southfield freeway, just south of Southfield city. This Skyhawk was the first car I owned new, and I drove it 130,000+ miles before it died ignomiously under my less than skillful driving. That was when I found out about drop-throttle oversteer and its effects, even in a front-wheel drive car. Notice any resemblance with the previous pictures? That’s right. The camera may have changed, but the results are exactly the same. Apparently, I can’t take an in-focused photo. I was just in an empty parking lot, too. 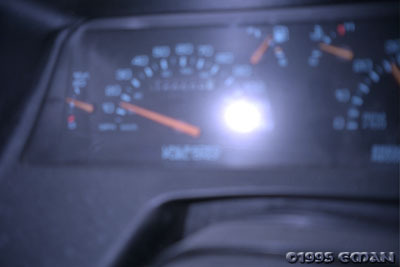 It’s supposed to be a picture of the Beretta’s odometer at 100,000 miles. 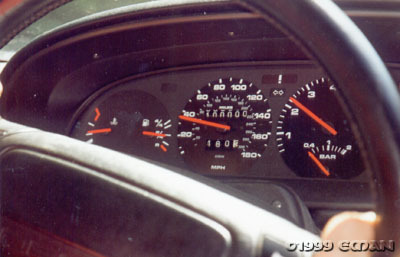 So the Beretta was the second car that I drove from new to 100,000 miles. It took roughly the same amount of time as the Skyhawk, and surprisingly, about the same distance. You’re probably saying to yourself -- “Hey! It’s in focus!” That’s because I didn’t take the picture this time -- my girlfriend took it (I was busy driving). It was taken just north of Berchtesgaden in Bavaria, ...er, Germany. I bought the Porsche with about 25,000 miles on it, so I didn’t drive all 100,000 miles myself. 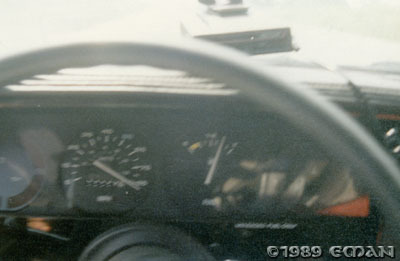 However, the 75,000 miles I added happened at the same time that I was racking up mileage on the Beretta. That means that in about 15 years of driving, I put about 355,000 miles on my cars, averaging just under 24,000 miles a year. While this may not seem a lot, for most of those years, I lived less than 10 miles from work, which in America, is quite amazing. I’ve taken a slight hiatus from driving since I’ve been in Regensburg, and I’ve actually enjoyed not driving. We’ll see what happens when I return to the States.